If you don’t know by now that I have one of only 50 TRD Toyota Cavaliers ever made. 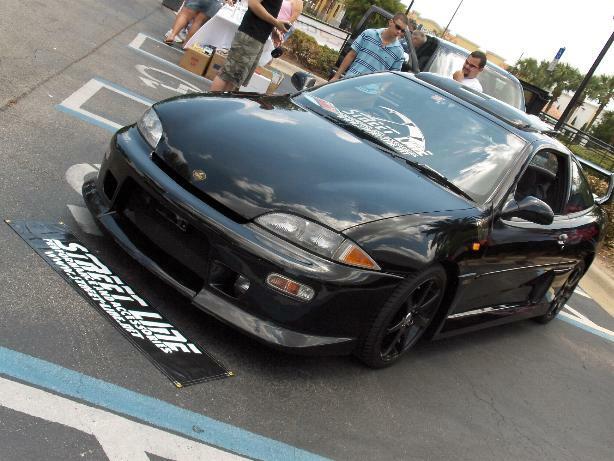 Well 2 weeks ago I took the car to Hot Import Nights Orlando. I never thought that the car would even place since I am us to my other Toyota Cavalier that is heavily customized to the hill! But I won 2nd place for JDM class. You should have seen peoples faces and the crap they where saying when they called out the TRD Toyota Cavalier, it was priceless! I just had to share this with the J-Body scene. good job man. i bet all those people were thinking you made up a Toyota Cavalier. Vote for me at Motortopia.com! Thanks! congrats man. here in hawaii, there hasnt been any cavalier that entered for a car show in 6 years. Funny thing is its STOCK! haha just wait till the other Toyota Cavalier comes back out soon. ps - steve i emailed u before but u never got back to me, please email me or contact me. I know i look dumb for asking but, but what did the TRD Toyota Cavalier have different then the regular toyota cavaliers? Was it like the Z22 and Z24 models, or more the 2003-2005 "Z24s", that had the same engine but different image package. ...but the pics don't do it justice. The car looks so much better in person. It's a Right Hand Drive car, i.e. steering wheel is on the right. Thats awesome man!!! I love to see cavys win at import shows. It always brings a smile to my face!!!! dam i cant believe the photos are still up I need to make a new topic and show all the new upgrades on both Toyota cavaliers. Yea lets see these cavs jdm style! Too bad I can no longer see the images.